Egypt-How Inept Can We Get? There is very little common sense coming out of Washington DC regarding the crisis in Egypt and what our role, and indeed the role of all civilized societies, should be regarding Egypt. The Obama Administration set up the downfall of Mubarak and the rise of the Muslim Brotherhood to political power. Obama is still trying to force Muslim Extremism onto Egyptian society by pressuring the Military in Egypt to temper their response to the Muslim Brotherhood. Then you have our inept Republican hacks who can’t stay away from a TV camera or a Sunday Talk Show screaming that we have to pull all aid our of Egypt. Most of the Democratic hacks can’t figure out who to back or what to do! Muslim Brotherhood = Terrorism: The Muslim Brotherhood is an International, Radical Islamic group hell-bent on establishing Islamic Republics, NOT DEMOCRACIES AS OBAMA KEEPS SAYING, all over the Middle East and the World. International Muslim Brotherhood: The Muslim Brotherhood has infiltrated all western countries through the spread of the MUSLIM STUDENT ASSOCIATIONS, that are student fronts for the radicalization of whatever country they have infiltrated. Nature of Egyptians: The Egyptian People themselves are NOT radical. They are extremely POOR. Egypt is the largest importer of grain in the world. Egyptian Military: The Egyptian Military, by and large, are the people and the only “political” group who has the overall best interest of the Egyptian people. Egypt’s Poverty Problem: The majority of the 83,000,000 plus Egyptians live on $2.00 per day without any prospects for improvement in spite of the industrious nature of the people. Egypt’s Stable Past: Egypt has been one of the few stable, Western Friendly, nations in the Middle East and the only Arab nation with a treaty with Israel. Role of Tourism: Tourism is one of the very few sources of Free Foreign Currency for Egypt and with the radicalization of the country via the Muslim Brotherhood tourism is at an all time low. What the US and Civilized Nations Need to Do NOW! Economic Vs Military Aid: Western Civilization, especially the US, needs to create an Aid package that is economic and focuses on providing the Military Government with food to feed the Egyptians then coupled with a solid US-AID program to develop the hundreds of thousands of acres along the Nile and south and west of the Aswan Dam for food production to PERMANENTLY lift the Egyptians out of poverty. Egypt has that rare combination of land and water that can be developed for the good of the entire region. Egypt has been historically an agrarian based culture and we need to help them re-establish those roots. War on Terror Based Military Aid: Western Civilization needs to create a Military Aid program that focuses on providing less of outward focused military to a military that can protect Egypt from internal terrorism, including that from the Muslim Brotherhood. Give the Military and the People Time: We need to make sure the military has sufficient time to sit down with legitimate factions inside of Egypt, excluding the Muslim Brotherhood, and formulate their own government structure which may or may not be our idea of a democracy. We forced the military before, after the hasty ousting of Mubarak, to have elections and put on a pretense that Egypt was back to normal. What hypocrites we are. It took the US over 12 years to come up with our new government after declaring our independence! Egypt needs time for the internal political groups to coalesce and form. We need to stop the political rhetoric in our country regarding what the Egyptian People need to do. They are intelligent and they can and will figure it out if the US, the UN and Europe stays out of their internal “birthing” of a new society. Micky and Minnie Mouse, McCain and Graham, need to stay off of the talk shows and stay HOME! Not a one of these politicians have ever lived among the Egyptian people or been over to one the homes of a middle class Egyptian and attended one of their kid’s birthday parties. I have. We need to do our part to make sure Iran and the Palestinians do not export their Islamic radicals to Egypt to further exacerbate the internal problems facing Egypt today. Alas, I do not believe Obama nor our Republican or Democrat politicians will do the right thing in the end. Obama is bent on establishing radical Islamic regimes throughout the Middle East and heaven only know what the rest of these politicians are trying to do. Misguided religious fervor is probably one of the most dangerous phenomena known to man since the beginning of time. The quest to spread YOUR TRUTH to unbelievers can be one of the most powerful human emotions, especially when that quest is politically inspired and abetted. The US Media’s overwhelming fervor and committment to jointly protect Obama, regardless of the facts, is indeed kin to a religious oligarchy. The media’s committment to the re-election of Obama is a professional virus that has infected almost every major media outlet in the US, and to some degree, the globe. Some of the media who are unequivocably supporting Obama have witnessed their own following and fortunes diminished by this fervor but disregard the impacts due to their blind following of their false prophet. This blind following that is costing them respect and in some cases loss of treasure, is not unlike the Islamic Suicide Bombers who relegate their own lives to that of their ideals. For sure the media has been “purchased” over the past 100 years by well to do Progressives that seek to install their utopian/statist ideals in America and replace our Constitutional Republic with a Progressive agenda based socialist regime. Since the failure of the Democrat party in 1964 to support the Civil Rights Act of 1964, the Progressives have totally infiltrated the Democrat party and have usurped the Civil Rights causes as a means to its end, the complete and utter takeover and degradation of America. Their false prophet Obama prophesied that he will “…fundamentally transform America…” And, he is working on it with the total blind support of his sycophants in the media. The creation of a Progressive media was accomplished over time and one of the primary tools used in this process was higher education. Journalism schools and prestigious Ivy League Universities were infiltrated with Progressive Professors who indoctrinated would be journalist with Progressive Ideology. I am absolutely certain that these journalist have no clue that they have lost the ability to objectively analyze a set of facts using their innate logic over their indoctrination. Those who are not 100% converted, dominate the RINO media and espouse a philosophy of “compassionate conservatism” which means allowing a Progressive Takeover, but just at a slower pace. These people, who I lump into my own category of “Rinocracy“, are easy to spot. They have a badge on their blazer that says I am a conservative while criticizing someone like Mitt Romney for criticizing Obama during a time of international crisis even when Obama is completely feckless! Islam was created and codified by their Prophet Mohammad and the followers of Islam are in fact the followers of Mohammad as their sacred religious icon. Islam is not only a religious belief and institution but is actually intended to be and control the “State” of the followers of Mohammad. The ultimate goal on earth would be a single, Iran like, Islamist “Republic” where all of the followers would be part of one Islamic Nation. The two primary religious sects of Islam, the Sunnis and the Shiites, differ in several respects with one another but have a common belief in the Quran as the writings of the prophet Mohammad. Make no mistake, their Islamic religion can be the overriding, and most important part of their life and their life’s goals. Some Muslims that have migrated out of their home countries have tempered their fervor to some degree but there is a fine line between their allegiance to their adopted country and their religion. The latter usually trumps the former in the final analysis. The blind following of Islam by well off, educated American-Islamist like Anwar al-Awlaki are examples of that line that is sometimes crossed to the extreme. The blind following of Islam is no better described than by the existence of suicide bombers. The will to live is the single most powerful human drive there is, unless it isn’t. Suicide Bombers and those who undertake sure-to-fail missions have supplanted their will to live with a committment to Islam and their Prophet Mohammad. When one looks at the blind allegiance of the US Media to Obama, and the allegiance of Islamist to their Prophet Mohammad, there is a parallel religious fervor attached to both. If Obama is attacked, or even does something utterly stupid on his own, the media is there to lift him back up on his throne and defends him to the bitter end without question. When someone who is politically motivated tells the Islamic Masses that someone or some country has defamed their Prophet Mohammad, the masses rise up in violent protest regardless of the facts. Groups like the Muslim Brotherhood, al Qaeda, Hamas and others can easily rile the Islamic masses and have them blindly follow their rhetoric or propaganda or call to arms. The American Press attempts to do the same for Obama and call his followers to action by a simple byline or a lead story on the nightly news. Each day they all receive their talking points and religiously spew them back out in unison in support of their false prophet, Obama. We have literally witnessed the death of the “Fourth Estate” in our lifetime. The ultimate irony of these two parallel universes is that they ultimately cannot exist together. The progressives are pro gay, pro abortion, and in general anti religion and secular oriented. 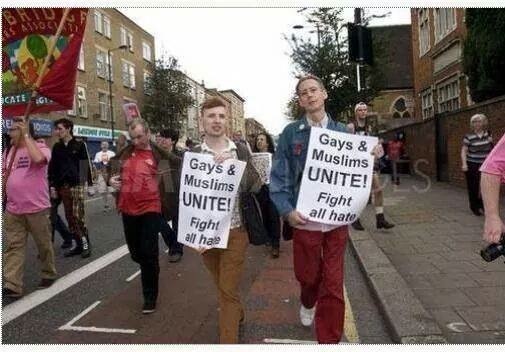 Islam has very strong beliefs against gay relationships, abortions and secular activities of almost any kind. The Islamist abhor Hollywood and its vile secular films and television shows. The irony is that the followers of Islam and the followers of Christianity have more beliefs in common than do the Islamist and the Progressives. I seriously doubt that CNN’s Don Lemon or Anderson Cooper, both self-professed gay, would go to Iran and interview Mahmoud Ahmadinejad, as Iran hangs gays. I doubt that Ang Lee would have gone to Iraq, Iran, Pakistan, Afghanistan, or any other Islamic country and promoted Brokeback Mountain. PS: Thanks to cousin Kathy for her observations and bringing this comparison to my attention! MB Origins: The Muslim Brotherhood (MB), originally started in Egypt, is the single largest danger in the spreading of radical Islam than any other force on earth. They are organized, they are global, they have infiltrated all of the major societies including the United States, they are committed and they have a great deal of patience. Enter Obama: Until Obama took office, the MB was banned by President Mubarak and could not form a political party nor exist publicly in Egypt. Then Obama made his big Cairo Speech in 2009 that basically condemned our long-term ally, Mubarak, and set the state for the MB Abetted uprising this year that ousted Mubarak. With Mubarak gone, the MB is was free to form its own political party and odds are they will control the majority of seats in the Egyptian parliament and seize power. Bumper Sticker Help: Their original campaign slogan was, “Islam is the solution.” But, the military ruling council has dictated that political slogans in the upcoming elections must not use religious slogans. Heaven forbid, sorry for the religious reference, the mainstream media won’t have to report that religious fanatics stole the Egyptian election! AS IF! The ruling council seeks to mask the true victors in this election and allow the MB to seize control over the country and share power with the military. This will be the official to the 1979 Egypt–Israel Peace Treaty. President Sadat died as a result of this treaty now his death will be in vain. Thank you President Obama. So my friends, what is going on in Egypt directly impacts what is going on in the US. If the MB could create a world-wide network of organizations dedicated to the destruction of existing societies by replacing them with Islamic Republics at a time when they could not even exist officially in their host country, Egypt, how much more will the be able to do once they take over the most populous Muslim country on earth? DAWA as a Front: The MB will continue to preach that they will only use tactics they describe as Da‘wah or Dawah that has now morphed into Dawa. Go to this website (http://www.dawanet.com/methods/publicschool.dawapublic.asp) to see what kind of programs the MB is creating for US Public Schools. Sounds peaceful enough until you realize that the MB is committed to Sharia Law and the elimination of infidels (You and I). The Clueless Supporters of the Left in the US: I sort of chuckle when I hear the Left in this country defend the right of the MB to exist along side of legitimate peaceful factions as if the MB is just another Democrat or Republican Party. This is especially true of the Gay constituency of the left who will be systematically eliminated via Sharia and Islam. Also true of Catholics, Mormons, Baptists and all other Christians, Jews, Buddhists and any other individual who eschews the teachings of the Koran. And the Left wing Women’s groups are also in for a very big surprise and wardrobe change! Get in the back ladies, you have to follow behind you “man” and cannot go out in public uncovered and unescorted. And if you get caught fooling around, well then they will invoke “Honor Killings” in your honor and whack you! Illegal Aliens from Mexico who are predominantly Catholic, better invest in a prayer rug as Sunday Mass will go away, just ask the Coptic Christians in Egypt today. Islamic Republics are not the epitome of freedom, quite the opposite. Obama is enacting his “Obama Doctrine” daily which basically includes support for secular uprisings against secular governments and a lack of support for secular uprisings against Islamic Regimes. (See the Emerging Obama Doctrine, http://wp.me/pY51c-fs) The only goal that could be expected to be reached with this doctrine is the eventual installation of Islamic Republics, like Iran, throughout the Middle East and North Africa. Obama pushed Mubarak out of Egypt while coddling Ahmadinejad in Iran when the Iranians tried to overthrow the Iranian Theocracy. He did not support Ben Ali in Tunisia but did support the fundamental uprising there in Tunisia. The same can be said for Jordan, Yemen, and other Middle Eastern Countries. The end result will be total Islamic fundamentalist control over the region. When the Middle East and North Africa become controlled by Islamic Republics, the West will face challenges that it is not prepared to face. Israel’s existence will be threatened daily by the Islamic Republics who will not recognize its right to exist and will seek to drive out the Israelis and give Israel to the Palestinians. The OPEC Oil Cartel will be dominated by Radical Islamic Fundamentalists who will seek to destroy the economies of the West by forcing high oil prices. With Iran achieving the status of being a “Nuclear Nation”, along with its neighbor Pakistan, the Islamic Republics can basically blackmail western and eastern Europe in to submission on practically any level. The nuclear technology will be spread throughout the Middle East and used against the west when needed via terrorist organizations such as Hamas, Hezbollah, and others so the west will have to make a choice of whom to retaliate against, assuming Obama is no longer in office. If he is, retaliation will not be his policy. I heard a brilliant commentator yesterday saying that even if the Middle East became dominated by Islamic Fundamentalist, the U.S. get most of its oil from Venezuela, Mexico and Canada. (Notice the U.S. itself was missing from this group.) Great, so we rely on Hugo Chavez in Venezuela who is closely aligned with Iran, Russia and China; and Mexico who is basically being ran by the drug cartels. Assuming we don’t insult Canada like we have the rest of our allies under Obama, we may get some natural gas from our northern neighbor. Does any rational thinking person think that Chavez and Mexico won’t side with the OPEC Oil Cartel? So what can we expect our world to look like when Egypt, Tunisia, Yemen, Jordan, Pakistan, and the others transition into one form or another of Islamic Republics? Israel will be under constant threat of Annihilation by its neighbors. The most likely scenario will be that Israel feels that it has to preemptively attack Iran, Palestine, Pakistan or another Arab-Islamic Nation to prevent them from attacking Israel first. This will cause retaliation to occur and a whole domino effect will ensue. Where will the West, China and Russia stand if this happens? Will the West basically sacrifice Israel for their own short-term peace. If Obama or another Progressive like him is in office, Israel is gone. Oil Prices will level out at $150-$200 per barrel driving our gasoline past $10.00/gallon. Our trucking industry will be decimated due to rising fuel costs. Shipping within the U.S. will be at premium rates and stifle commerce to a crawl. Home heating and cooling costs will skyrocket to an average of $1,500-2,000 per month per household. Regulated brownouts will be the norm everyday during all usage periods. Our eBusinesses that are operated inside of the U.S. will not be able to function with a lack of consistent electricity to run their computer systems. These server farms and operations will be moved out of the U.S. to where electricity can but purchased at reasonable rates with consistent supply. Agribusiness will be at a standstill due to a lack of fuel and our ability to grow food will be seriously hampered. The result will be that U.S. GDP will be reduced by 20-25% and the U.S. government will not be able to “stimulate” the economy as they will not be able to sell our debt as our economic standing in the world will be drastically reduced. The U.S. government will probably have to sell our souls to a country like China to survive, whatever that will mean. The Nuclear Proliferation of an Islamic Middle East will make the Cold War look like two kids playing in a sand box. When the U.S. and the Soviet Union were basically on par to assure mutual Annihilation, the one saving grace was that neither side was basically suicidal. A nuclear Islamic Middle East will not share that lack of suicidal tendencies. Assume that the monarchy in Saudi Arabia survives 5 years while the majority of the Middle East is transformed into Islamic Republics. Do you really think that a Shia Iran will allow a Sunni led Monarchy in Saudi Arabia stand without threatening nuclear attacks to unseat the monarchy? Assume that food becomes scarce and the Middle Eastern Islamic Republics need food to feed their populations. Don’t assume for an instance that they will not use the threat of a nuclear strike to obtain food or anything else they need to survive. Assume that the U.N still exists in 5 years and China, Russia, United Kingdom, France and the U.S. try to send “paper” bombs in the form of U.N. resolutions to force the Islamic Middle East to do something. Do you really think they will care if we pass a resolution? They haven’t yet and they don’t even have massive nuclear weapons at this time. After Obama failed to support the Iranian dissidents in Iran who were trying to topple the Radical Islamic Regime led by Islamic Fundamentalists; After Obama sided with the “Muslim Brotherhood” in Egypt allowing for the eventual downfall of the current secular leadership in Egypt that will probably be replaced by an Islamic Republic; After Obama Failed to confront the human rights abuses against the brutal dictator Hugo Chavez in Venezuela; After Obama continues to ignore the anarchy in Mexico and completely turn a blind eye to securing our southern border; HIS FLAWED BUT VERY DELIBERATE “OBAMA DOCTRINE” IS EMERGING IN FULL BLOOM!. The Radicalization of the entire Middle East whereby Islamic States replace the current governments of Egypt, Saudi Arabia, Tunisia and Jordan. Support for Communist style dictators or ruling drug cartels in oil-producing countries in South America and in Mexico. Use the EPA, Department of Energy, Department of Interior and other agencies to shut down energy exploration and development in the US. Solidify the Islamic stronghold over the Middle East and Africa and isolate Israel into a regional submissive posture. Make the US totally dependent on Foreign Energy at very high prices in order to force his Green Agenda down our throats under the guise of National Security. He gets the added bonuses of the probable, eventual annihilation of the State of Israel, a total desecration of our global leadership position, and the creation of a four-way global leadership role with Russia, China, the Islamic World and the US sharing power to some degree. The US, the EU and other allies of the West better wake up and start protesting against the Obama Doctrine before it is totally in place. Once it is, there is no turning back, EVER. The scary part of this doctrine is that our media continues to be just another agency of this administration spewing forth the “company line”. “Congressional Outrage” has been almost non-existent and there is really no national outcry against Obama’s transparent actions. In a blog that will be published later today, we will go into the historical details surrounding Egypt’s path from a British colony to an Islamic State in an article entitled “The Islamic Radicalization of the Pharaohs, Egypt’s Path to Destruction”. Keep a close eye on Jordan, Saudi Arabia, Iraq and Tunisia. Those four nations are next in line to become “converted” by the Muslim Brotherhood. Don’t rule out Afghanistan after we tuck our tail and leave that country. Remember, the Muslim Brotherhood, who our press is treating like a modern-day version of the Cuban terrorist Che Guevara, was founded in 1928 in Egypt by the Islamic scholar and Sufi schoolteacher Hassan al-Bana with the “stated goal to instill the Qur’an and Sunnah as the “sole reference point for … ordering the life of the Muslim family, individual, community … and state”. In short, the creation of Islamic Republics following Sunni teachings and Sharia Law. While the Sunni do not believe their Shia brothers in Iran and other Shia nations are legitimate representations of Islam, their hatred of Israel and the West trumps their disdain for their Shia counterparts. They will use them against Israel and the US whenever necessary. Obama and his Green Agenda are inextricably tied together with the turmoil in the Middle East and in the Americas. Oil Prices have once again gone over $100/barrel and could rise significantly higher. Think for a moment, if Saudi Arabian Oil is cut off, Saudi has the largest reserves in the world, what will happen to world supply/prices? Radicals like Iran’s Mahmoud Ahmadinejad will be in control over our economy and can dictate the terms of our surrender without firing a shot…! You are asking yourself what is the role of Obama’s Green Agenda? To save the US from being cut off from our industrial lifeblood, oil? NOPE! It is the mechanism he is using to stop our exploration and further development of our own energy independence and thus reduce our economy to a mere shadow of its capacity. Progressives seek global economic and social parity at all costs. Our dominance is an anathema to them and the Obama Doctrine is what the progressive Doctor ordered!